When our old garden cart was stolen—yes someone actually made off with that old cart—replacing the 30+ year-old standby wasn’t a walk in the park. The reason the old cart (which by the way was on its third set of wheels) survived so long is that it was just right for our needs. Though its condition was pretty good, it did reflect its years of service. Its metal tub had been painted and re-painted several times, but it wasn’t rusted out. And then there were those spoked wheels. Spoked wheels are vulnerable when a cart gets heavy use. The second set of wheels was actually fashioned of plywood, making the cart look like something Fred Flintsone would use. But they worked and lasted years before they finally delaminated. The newest set of wheels had been installed about eight years ago, and still had plenty of life in them. It might not have been the prettiest garden cart on the block, but it worked and it was ours. One of the great things about the old cart was its large tub that was flat on the bottom, and had a straight front which was convenient for raking things like leaves or pine straw right into the cart. Not only used for the garden and to haul firewood, the cart also served as a dock cart to transport items out the dock to the boat. If you’ve shopped for a garden cart recently, you’ll know that similar carts are scarce as hens’ teeth. We did find a really nice garden cart on the Internet (http://www.mullerscarts.com/) a beautiful cart called the Smart Cart, and had our budget been bigger it would definitely have been our first choice. It has to be the Nirvana of garden carts with a sturdy aluminum frame, good looks and obvious serviceability. Of course it is made in Maine. However, we did discover a somewhat similar cart at our local Ace Hardware store, one that fit our needs and budget. So after nearly a month of searching, comparing, rejecting the common choices, fretting over the replacement and gnashing our teeth over the theft of the other one, we finally brought our new cart home yesterday. It’s called the Yard Rover (http://www.acehardware.com/product/index.jsp?productId=3450946). It has inflatable tires, a sturdy plastic tub (or some plastic-like substance) and though the front of the tub isn’t straight, it isn’t difficult to rake leaves, etc., right into the tub when the front is lowered to the ground. We’re happy to once again have a garden/dock cart and you can bet we’ll will be guarding this one closely now. The work continues on the rose bed. Through the heat, and bugs (yes, more mosquitos) and some of the warmest fall weather on record, the work has gone on. The weeds are history, though I suspect there is still some of that demonic Bermuda grass lurking somewhere below the surface. The package of landscape fabric warned that it is one mean customer, able to penetrate not only landscape fabric, but asphalt and concrete as well! I dug out roots of that stuff from more than a foot deep. Plus there were multitudes of tiny Colocasia bulblets everywhere, and many of their fleshy roots too. (Let this be a warning to you about these invasive plants) Practically sifting the soil was the only way to remove all of them. After going through the soil (mostly sand) by hand, next I turned it by shovel. That exposed even more roots of the Bermuda grass, and things like dollar weed and betony too. After smoothing everything out, I applied a liberal sprinkling of weed preventer Preen, a corn gluten product that has already proved itself in the vegetable garden. On top of that went another scattering, this time of unscented clay cat litter to help add some water-holding capabilities. I also spread the contents of a large bag of charcoal briquettes. Had to put them in there whole because those suckers are just about impossible to break up. (I tried smashing the bag with repeated blows of a shovel with no success.) On top of that went 10 bags of composted cow manure. Together the clay litter, charcoal and cow manure will help build up the sandy soil, providing nutrients and moisture retaining properties. 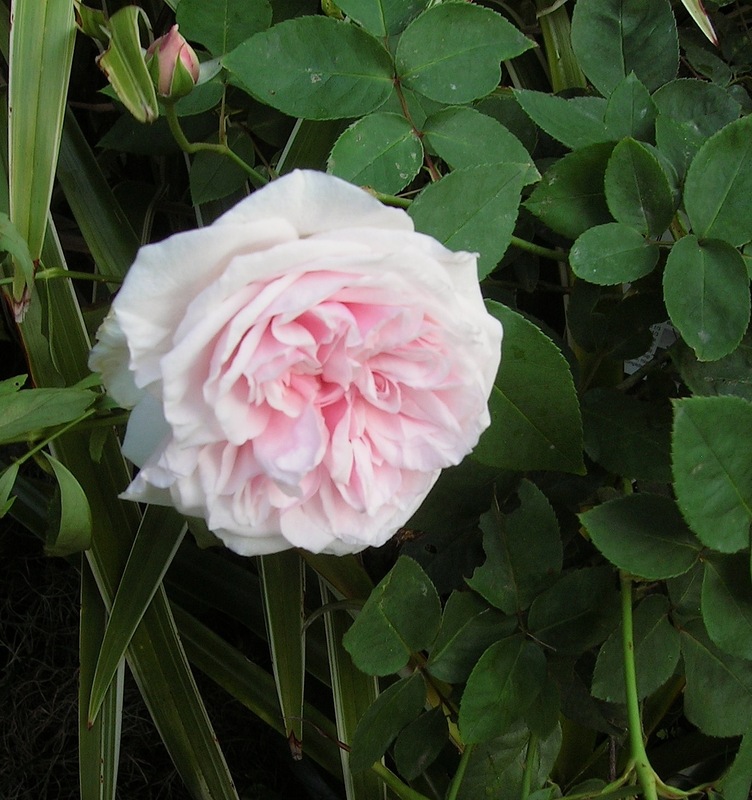 At that point I transplanted the Zephirine Drouhin rose. Quite large, the bush had to be pruned by a substantial amount, which is easier on both the bush and person moving the bush, when transplanting such a large specimen. When introducing new plants, and especially when moving established plants, I like to water them in with a root-stimulating hormone concentrate mixed with water. In the coming weeks I will re-apply the mixture several times to give the new plants and transplants a good start. I also planted the little Souvenir de la Malmaison rose, a Mini Penny hydrangea from the pot it had been in for a couple years and a Princes flower (Tibouchina) that I had started from a cutting several years ago. It was situated at the edge of the bed as it can grow to 15 feet, but its pretty purple blooms are worth the space it will eventually command. However, if we have an especially cold winter, it will be “toast” in our Zone 9B location. I put the larger items in at this point before laying down the weed barrier, mainly because of their size. Smaller items will be easier to “insert” into the fabric later. Next step was the laying down of the landscape fabric. Cutting four-inch lengths of aluminum fencing wire, I fashioned “pins” to hold the fabric in place by bending the wire into “U” shapes. It took the better part of a day to get the fabric in place, cutting out areas for existing plants. Using the U-shaped pins the fabric was locked together with three-inch (or greater) overlaps. On top of the fabric went the soaker hoses and I had to use bricks to hold the hoses in place as I worked them through the bed and around the plants. Last the piles of Spanish moss and oak leaves I have been stock-piling for weeks were spread overall to create a thick mulch. Then on top of that went another liberal application of Preen. Now, all I have to do is transplant the smaller items, and then wait for everything to get settled in and start putting out new growth. Whew! I’ll post more photos as things start looking better. Don’t waste time and money searching for just the right gift box for your homemade (or purchased) gifts. The box you need is near at hand, right in your pantry and you can recycle that cereal box, or tea box or just about any box in minutes. It’s easy and a great way to get a nice gift box for free. Better than that, you are actually recycling with this project. 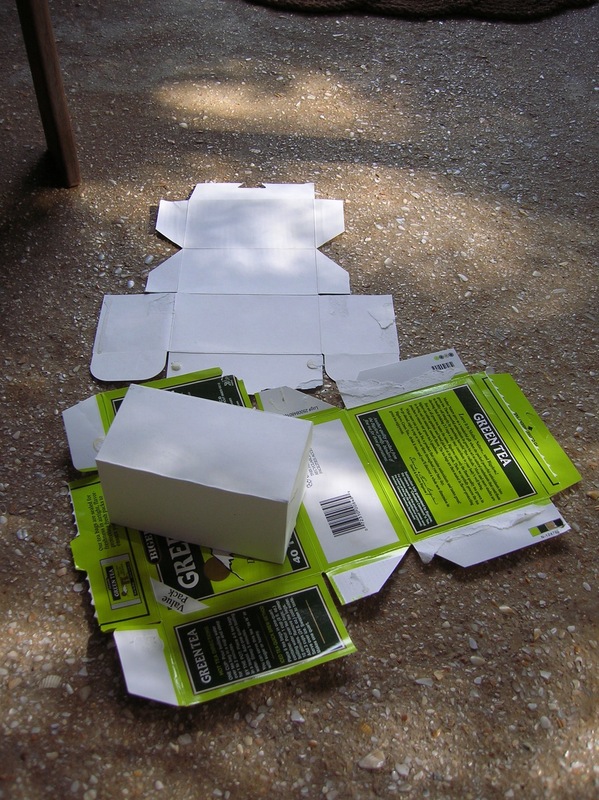 First disassemble the box by carefully slipping a table knife along the flaps that are glued. You will end up with a flat piece of boxboard. Most food (and other) boxes are white inside—perfect for gift boxes. Note where the glued areas were, and apply a line of glue on those places folding the flaps in to get a box shape. Use clothes pins or a rubber band or two to keep the “new” box together. For first-timers it can be a bit confusing. So try recreating the box with the white side out before you start in with the glue until you are comfortable with the process. When dry, you are ready to wrap and go! Once they open your gift they’ll see how clever you really are—you recycler you. 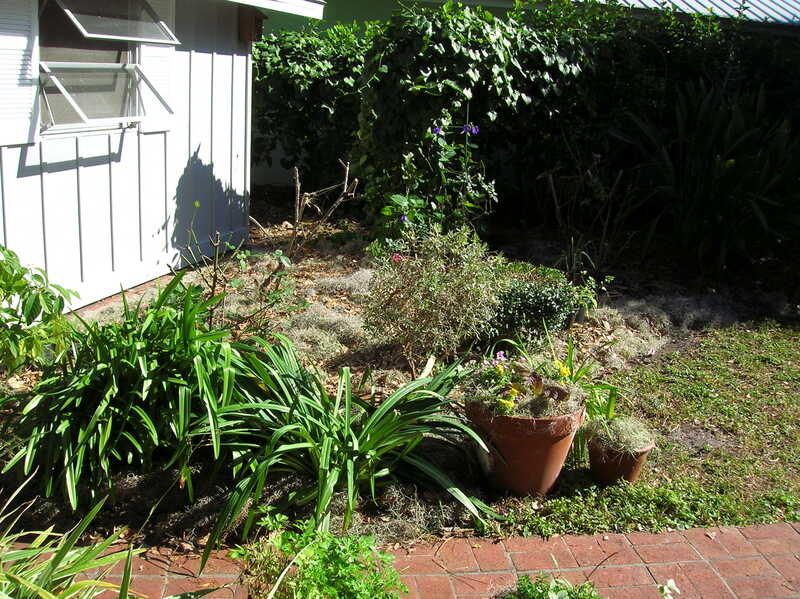 The roses, bird of paradise and other large plants were left en situ, while I cleared the rest of the bed to remove the tenacious weeds that had staged a full-scale occupation of the rose bed. The things I go through to garden. For the past six weeks I have been sweating and swatting mosquitos (yes, it’s been a warm fall down here on The Point), down on my knees tugging at weeds and potting up all the small plants that have been struggling in the rose bed. My plan is to get the rose bed cleared of weeds—and I’m dealing with some doozies. There’s the common stuff like dollar weed and air potatoes (aaarrgh!) that have colonized the space. But then there are a couple real thugs that have almost eclipsed the air potatoes and dollar weed. That’s why all the small stuff like amaryllis, salvias, agapanthus and other things were struggling too. One is a colocasia (Okay I’ll admit that I planted the darned thing to begin with, but it seemed so small and innocent when it went in. Pretty too. Never trust a pretty face!) that had spread throughout, and was shading almost everything. The second is some Godzilla of a grass, devil-spawned. It has roots that run about a foot below the surface and are tough as rigging wire. Forget pulling it out. Not possible without dynamite. As for the colocasia, it produced thousands of little bulblets, ready to spring into action, and spread roots far and wide in its garden coup. But! Believe it or not I have almost finished Stage No. 1 of the overhaul. I’ve moved all the small stuff out and into pots or flats—and that in itself was no small task. There were thousands, nay tens of thousands, of mini monkey grass plants to establish in flats. Some of that has already gone into new beds elsewhere. The rest, about 15 flats of it, is waiting for a new home. I gave the weeds a chance to sprout back up so that I could spray them with my home-grown herbicide (RECIPE: one GALLON white vinegar mixed with one CUP salt). Did that a couple days ago and some of the interlopers seem to be responding. We’ll see if I need to do a second spraying. I am told this concoction will work on the most diabolical of weeds, even poison ivy. Yeah, we’ll see. In the meantime I’ve been over to St. Augustine to Southern Horticulture and succumbed to the charms of an heirloom rose bush by the name of Souvenir de la Malmaison. Oh my, what a sweetie. Lots of eggshell pink blooms with a delicate fragrance. Already have a place for it in the bed, now that I’ve sorted things out in there. Next step, once the weeds are dead as door nails, is to spread a good layer of compost and some crushed charcoal (you know the bio-char thing). Then a layer of landscape fabric (Love that stuff!) 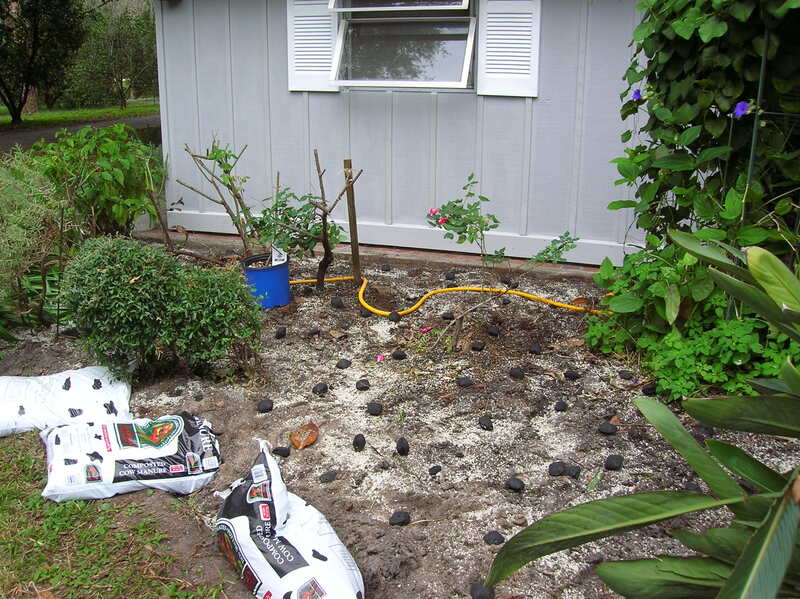 goes into place, on top of that I’ll arrange the soaker hoses and then finally spread the three-inch layer of mulch. I’ve been stock piling leaves and Spanish moss for that purpose. Stay tuned…I’ll post the progress as it…well, progresses! ‘Tis the season for holiday homes and gardens tours. They are shining all over this time of year. Garden clubs and civic groups present the tours which feature local homes all decked out for the season. Whether it’s one in your home town or perhaps one in a favored vacation location, go ahead and take the tour! You’ll be treated to some of the most innovative Christmas decorating ideas, often many of which take advantage of locally-available greenery and floral selections. Plus you’re likely to see ways to jazz up old standards like poinsettias and utilize your houseplants in new and creative ways for the season. You’ll have the opportunity to visit, up close and personal, some of the most spectacular homes in the neighborhood and you are bound to be entertained and amazed. Not only that, you’ll also be helping to fund those local organizations that often depend on the events like these to raise money for events and projects throughout the year. Have fun and don’t forget your camera.